Welcome to the Department of Biological Systems Engineering at Washington State University. Our department has seventeen award-winning and internationally recognized faculty members. They conduct applied engineering research and outreach activities in four focus areas: a) Land, Air, Water Resources and Environmental Engineering, b) Food Engineering, c) Bio-energy and Bio-product Engineering, and d) Agricultural Automation Engineering. Our core research programs seek engineering solutions for better environment, renewable energy, productive and sustainable agriculture, and safe and nutritious foods. The Department offers advanced degrees in Biological & Agricultural Engineering and prepares students for successful careers in academia, industry, and government. About 70 Ph.D. students and 15 M.S. students receive a world-class education and conduct exploratory research along with over 50 post-doctoral researchers, research engineers, visiting students and professors. I invite you to visit individual faculty websites and engage in discussion to identify opportunities for education or research collaboration. I welcome prospective students and alumni to visit the department and meet with our faculty, staff, and graduate students. I look forward to working with you on strengthening our program and building a productive and rewarding future. 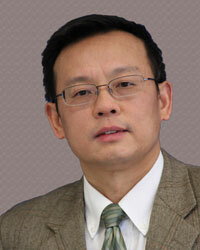 Learn more about Juming Tang, Ph.D.